Weight: 0.63 oz. 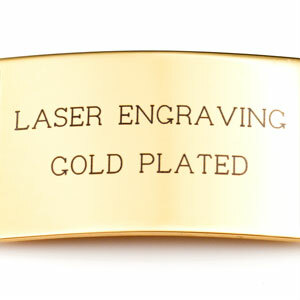 / 18 g.
This classic id bracelet can be engraved on front and back. Hypoallegenic. Made of 316L Surgical Stainless Steel. Clasp is 316L stainless steel. 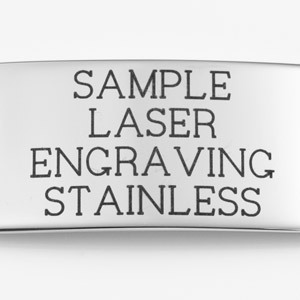 You can choose between traditional (etched) style engraving or black/lasered engraving for this item when you select your font. 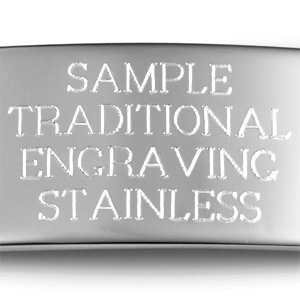 There is no color added in traditional engraving. 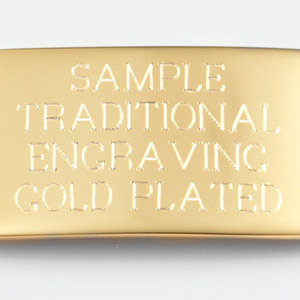 We simply etch the inscription into the metal in the font selected. 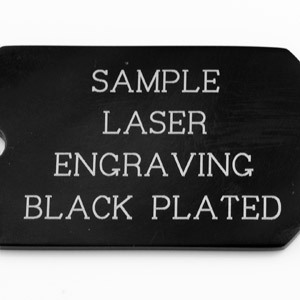 For black/lasered style engraving, the inscription is lasered onto the metal in black letters using either a Plain Block font or Block Fifth Avenue font. Most stainless bracelets on the internet are usually 304 Stainless. Although both are hypoallergenic 316L is non-corrosive. It is also known as marine grade stainless steel due to its increased resistance to chloride corrosion compared to type 304. Lobster clasp. High polished silver color finish.